Do you want a similar health care system for your state? SACRAMENTO, Calif. — Within hours of assuming office Monday, Gov. Gavin Newsom issued a defiant challenge to the Trump administration with sweeping plans to expand health coverage to more Californians, pushing for a single-payer system and insurance for undocumented young adult immigrants. He also called for new state-funded subsidies to help people afford health insurance, coupled with a requirement that all Californians have health insurance. And he signed an executive order that directs state agencies to work together to negotiate prescription drug prices. Newsom revealed his proposals on Facebook Live, following a combative inaugural speech earlier in the day in which he vowed to stand up to a “corrupt” administration in Washington and lead California along a progressive path. Newsom had campaigned for a single-payer system, and he said Monday that he remained committed to it. In a letter to President Donald Trump and congressional leaders, Newsom called on the federal government to allow California and other states to create a single-payer program. U.S. Rep. Ro Khanna (D-Calif.), who is working with Newsom, said Congress needs to pass a bill that gives states permission to create their own health care programs and still receive federal funding. While that request seems like a long shot in the Republican-controlled Senate, Khanna said he and other Democratic lawmakers want to start hearings in the Democratic-controlled House of Representatives — in preparation for when there is a Democrat in the White House. “Realistically, we’re looking at 2021 before this could become law,” Khanna said. Newsom’s out-of-the-gate move on single-payer reflects a clear shift from his predecessor, Democratic Gov. Jerry Brown, who had described the ambitious proposal — which could cost an estimated $400 billion annually — as financially impossible. Newsom’s announcement also gives momentum to advocates of single-payer both in California and nationally. As a candidate, Newsom had also backed expanding health care to young adults who are in the country illegally — a Democratic plan that died in budget negotiations last year when Brown balked at the estimated cost: $140 million for the first year. Newsom said his budget, scheduled to be released Thursday, will set aside state funding to expand Medi-Cal, California’s version of the federal Medicaid program for low-income people, to eligible adults up to age 26. That would make California the first state to provide full Medicaid benefits to unauthorized immigrant adults. In 2016, California opened Medi-Cal to all kids up to age 19, regardless of their immigration status. Since then, more than 250,000 children have enrolled. Immigration and health care advocates estimate that more than 100,000 young adults aged 19 to 25 could enroll if Newsom’s proposal is adopted by the state legislature. Immigrants in the country illegally make up almost 60 percent of California’s roughly 3 million uninsured residents. Newsom also wants California to become the first state to offer subsidies to middle-class families who struggle to buy health insurance. Under the Affordable Care Act, people who earn more than 400 percent of the federal poverty level — about $48,500 a year for an individual or about $100,000 for a family of four — don’t qualify for federal financial assistance to help them purchase their own policies. Newsom’s plan would provide state subsidies to individuals earning up to $72,840 and families of four earning up to $150,600. 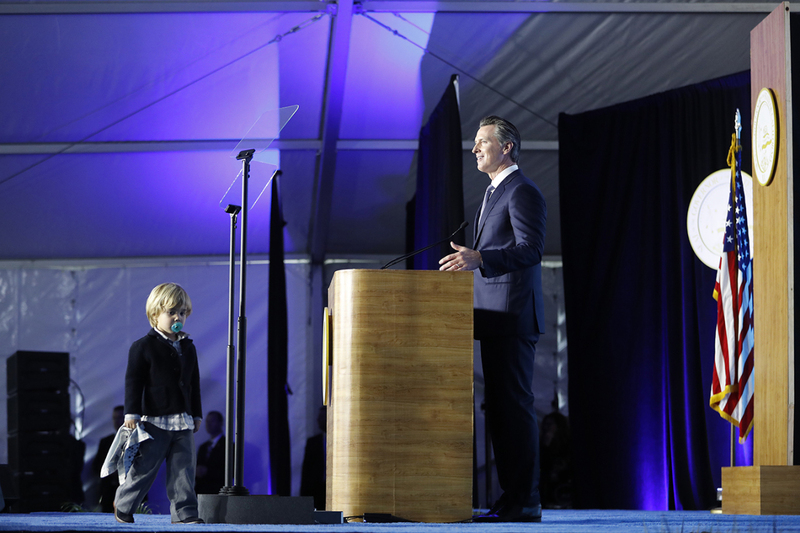 To pay for those subsidies, for which the new governor did not put a price tag, Newsom said he will ask the Democratic-controlled legislature to impose a health coverage requirement on Californians — and a penalty for those who don’t comply. The federal tax penalty for uninsured people under the Affordable Care Act went away on Jan. 1, a provision of the Republican tax bill of 2017. In other moves that don’t require legislative approval, Newsom signed an executive order creating the new position of California surgeon general, who he said would promote preventive care and highlight health disparities across California. The new governor also signed an order directing state agencies to collaborate on purchasing prescription drugs. Currently, state agencies negotiate individually with drug companies for prisons or veterans, for example. There are various ways the state could consolidate prescription drug purchasing, and some would require federal approval, said Erin Trish, associate director of the USC Schaeffer Center for Health Policy & Economics. A consolidated negotiator could achieve lower prices, but that could require limiting the number of covered drugs, Trish said. “You have to be willing to exclude coverage of drugs to have meaningful bargaining leverage to change prices,” she added. This and Newsom’s other first-day proposals underscore that California has a governor who intends to focus on health care, Trish and other policy experts said.